Initially I trained and practiced as a State Registered nurse in London. My interest in Complementary Therapies and Natural Health then led me to train as a Homeopath and subsequently a Reflexologist and CranioSacral Therapist. I have worked as a Health Care Professional for forty years. During that time I have held various posts. - Teaching at Homoeopathic Colleges, working on a Complementary Therapy project between Marylebone NHS Health Centre and Westminster University. 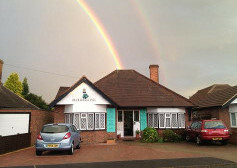 I also helped to set up and manage a Natural Health Centre in London, as well as running my own private practice in London and Little Chalfont. I have worked with inspiring teachers and students and currently work as a Complementary Therapy Coordinator for a Hospice at Home Charity, working as part of a healthcare team of nurses and therapists who treat palliative care patients, adults and children, with life limiting illnesses in their own homes. I also maintain my own private practice. I use my three main skills to help restore balance and wellbeing. Homoeopathy – Treating dis-ease with diluted substances from nature, using the Hahnemann law of similars to treat the whole patient and their unique set of symptoms. CranioSacral Therapy – A gentle, non invasive, hands-on approach used to evaluate and enhance body / mind function. Working with the cranial rhythm (A naturally occurring rhythm in the body that we are usually unaware of ) and the body fascia (connective tissue) to locate restriction and imbalances in the body and it’s systems. I use my experience and knowledge to prescribe one or sometimes a combination of therapies that I practice, based on the patients symptoms and wishes for their own good health. I treat all ages with these gentle and natural approaches. If you would like to speak to me directly before making an appointment at The Orchard Clinic then please call me on 01494-766346.